Uesco Cranes builds double girder cranes to meet the specific needs of different industries depending on the application. 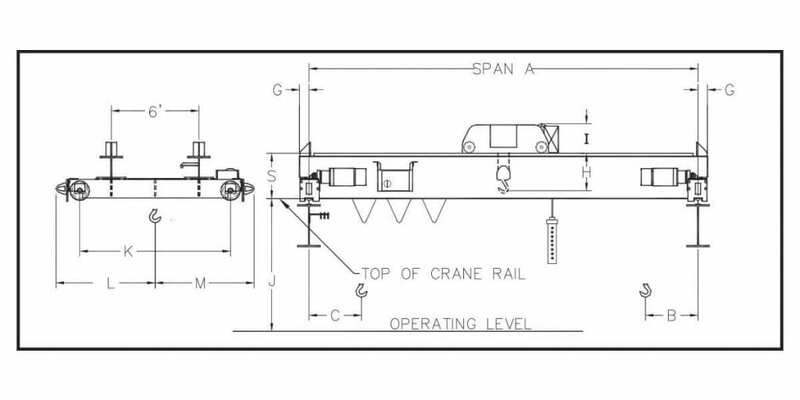 The double girder, top running, dual-motor stationary axle type of overhead cranes features capacities from 3 tons to 10 tons. These cranes require electrification and can be used for applications where a higher duty cycle is required. Each of these cranes has forged steel wheels hardened to 325 Bhn minimum with a tapered tread for operation on rails. End trucks are fabricated from plates welded to a rigid frame with a stationary axle. You may use a variety of hoist types, but frequently wire rope hoists are used. All Uesco dual-motor crane drives are double or triple reduction parallel shaft, helical/spur reducers splash lubricated for dependable service and longer life. Minimum B-10 bearing life is 5,000 hours. The bridge drive motors are flange mounted with a standard NEMA C or D flange and are 30 minute rated with Class F insulation. Thermal detectors embedded in the motor windings provide overload protection and meet the latest publication of the National Electric Code. Built of structural steel girders, which meet or exceed CMAA design specifications plus OSHA and ANSI standards, all of our overhead crane solutions have a minimum deflection of 1/600 with a built-in safety factor of 5 to 1. All Uesco overhead cranes are rated for a minimum CMAA Class C service. Standard speeds are 50, 80, or 120 FPM. Spans are from 20′ to 56′ in length. We also custom fabricate runways in different configurations depending on your company’s requirements. Rubber bumpers and rail sweeps are standard on all cranes. Dimensions B, C, I and H refer to the hoist manufacturer. DIM. S: 18" 18" 18" 20" 20" 26" 26" 26" 26" 29" 32"
WHEEL DIA. : 8.25" 8.25" 8.25" 8.25" 8.25" 8.25" 8.25" 8.25" 8.25" 8.25" 8.25"
K: 9'-0" 9'-0" 9'-0" 9'-0" 9'-0" 9'-0" 9'-0" 9'-0" 9'-0" 10'-0" 10'-0"
L: 5'-1.5" 5'-1.5" 5'-1.5" 5'-1.5" 5'-1.5" 5'-1.5" 5'-1.5" 5'-1.5" 5'-1.5" 5'-7.5" 5'-7.5"
M: 5'-1.5" 5'-1.5" 5'-1.5" 5'-1.5" 5'-1.5" 5'-1.5" 5'-1.5" 5'-1.5" 5'-1.5" 5'-7.5" 5'-7.5"
G: 4.75" 4.75" 4.75" 4.75" 4.75" 4.75" 4.75" 4.75" 4.75" 4.75" 4.75"
DIM. S: 18" 18" 20" 20" 20" 26" 26" 26" 26" 35" 35"
K: 9'-0" 9'-0" 9'-0" 9'-0" 9'-0" 9'-0" 9'-0" 10'-0" 10'-0" 10'-0" 10'-0"
L: 5'-1.5" 5'-1.5" 5'-1.5" 5'-1.5" 5'-1.5" 5'-1.5" 5'-1.5" 5'-7.5" 5'-7.5" 5'-7.5" 5'-7.5"
M: 5'-1.5" 5'-1.5" 5'-1.5" 5'-1.5" 5'-1.5" 5'-1.5" 5'-1.5" 5'-7.5" 5'-7.5" 5'-7.5" 5'-7.5"
DIM. S: 18" 18" 20" 20" 26" 26" 26" 26" 26" 35" 35"
DIM. S: 18" 20" 20" 26" 26" 26" 26" 29" 32" 42" 42"
WHEEL DIA. : 8.25" 8.25" 8.25" 8.25" 8.25" 8.25" 8.25" 8.25" 8.25" 12" 12"
L: 5'-1.5" 5'-1.5" 5'-1.5" 5'-1.5" 5'-1.5" 5'-1.5" 5'-1.5" 5'-7.5" 5'-7.5" 5'-11" 5'-11"
M: 5'-1.5" 5'-1.5" 5'-1.5" 5'-1.5" 5'-1.5" 5'-1.5" 5'-1.5" 5'-7.5" 5'-7.5" 5'-11" 5'-11"
G: 4.75" 4.75" 4.75" 4.75" 4.75" 4.75" 4.75" 4.75" 4.75" 4.75" 6"
DIM. S: 20" 20" 26" 26" 26" 26" 29" 32" 35" 42"
WHEEL DIA. : 8.25" 8.25" 8.25" 8.25" 8.25" 12" 12" 12" 12" 12"
K: 9'-0" 9'-0" 9'-0" 9'-0" 9'-0" 10'-0" 10'-0" 10'-0" 10'-0" 10'-0"
L: 5'-1.5" 5'-1.5" 5'-1.5" 5'-1.5" 5'-1.5" 5'-11" 5'-11" 5'-11" 5'-11" 5'-11"
M: 5'-1.5" 5'-1.5" 5'-1.5" 5'-1.5" 5'-1.5" 5'-11" 5'-11" 5'-11" 5'-11" 5'-11"
G: 4.75" 4.75" 4.75" 4.75" 4.75" 6" 6" 6" 6" 6"
DIM. S: 20" 26" 26" 26" 26" 32" 32" 35" 38"
WHEEL DIA. : 12" 12" 12" 12" 12" 12" 12" 12" 12"
K: 10'-0" 10'-0" 10'-0" 10'-0" 10'-0" 10'-0" 10'-0" 10'-0" 10'-0"
L: 5'-11" 5'-11" 5'-11" 5'-11" 5'-11" 5'-11" 5'-11" 5'-11" 5'-11"
M: 5'-11" 5'-11" 5'-11" 5'-11" 5'-11" 5'-11" 5'-11" 5'-11" 5'-11"
G: 6" 6" 6" 6" 6" 6" 6" 6" 6"
DIM. S: 26" 26" 26" 29" 32" 35" 38" 38" 38"